Another year of Valentine Day celebration . We did not do much , not super fancy dinner, no gift exchange . We went to a restaurant few day earlier then Valentine day and playing bowling with a group of friends . Finally have a home cooked roast and beautiful cake for our celebration at home in the weekend. I love the simple celebration , to have the close one doing normal daily stuffs . That is the dream I always wish before married , so there is no complain ^^. To make our dinner special , it got to end with a special sweet. I come by this food blogger ->Dailydelicious. The entrement she made is simply beautiful . From the element she used, you can imagine is simply delicious, rich ,sweet. The picture itself is already so appealing !! Everytime when I see the picture on internet food blogger, my this year wish is to improve in my baking & picture skill . So here is the cake I have bake for this year Valentine night celebration . I used the recipe above but did not do exactly as her creation. 2. Bring raspberry puree, sugar and lemon juice to boil. 3. Mix in the gelatine till disolve. 4. Pour the mixture evenly in 4 silicone molds. Freeze it overnight . 1.Place the water in a bowl sprinkle gelatin on it let it bloom. Place the bowl in a hot water and let it melt. 2.Beat the yolks with sugar until combine, boil the milk and pour the hot milk over the yolk mixture and whisking it all time. 3.When the milk combine well into the yolk, bring this mixture heat over low heat till 80C. 4. Take the pan away from the heat and add in the gelatin till disolved. 5. Place a sieve over the bowl of chocolate, slowly pour in the egg mixture through the sieve and wait for 1 minutes. 6.Stir untill all the chocolate melt, let the mixture cool to room temperature. 7.Beat the whipping cream till soft peak, put 1/3 of the whipping cream into the chocolate mixture mix well. 8. Pour the whole chocolate mixture to the reminding whipping cream, combine well. 2. Place one piece of chocolate cake at the bottom of the mold. 3. 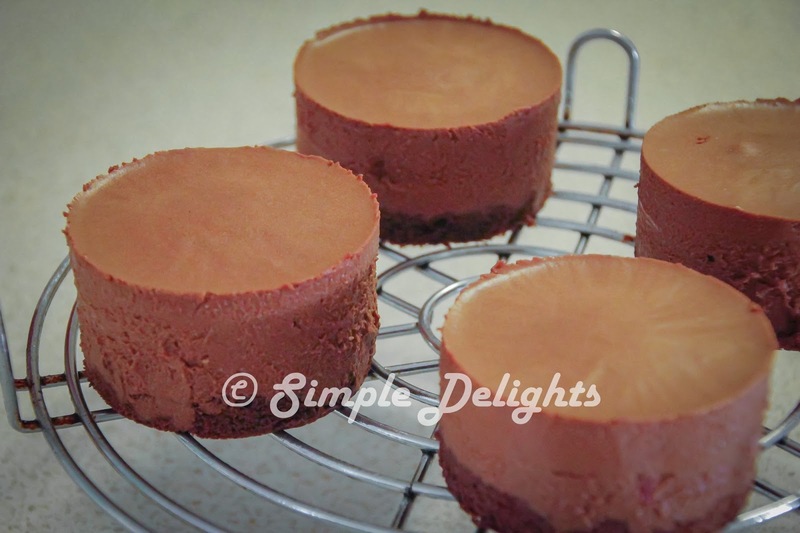 Pour in 2 tablespoon of the chocolate mousse, place the raspberry jelly in. 4. 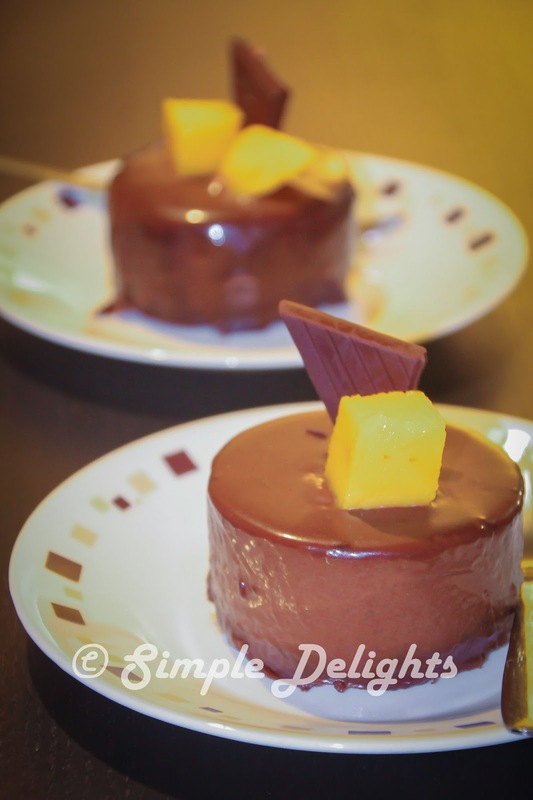 Pour in 2 tablespoon of the chocolate mousse to cover the raspberry jelly. 5. Place the cake in the freezer over night or at least 6hrs. 1. Bring to boil all the ingredienst expect both chocolate. 2. Pour it over the chocolate and stir till well combine. 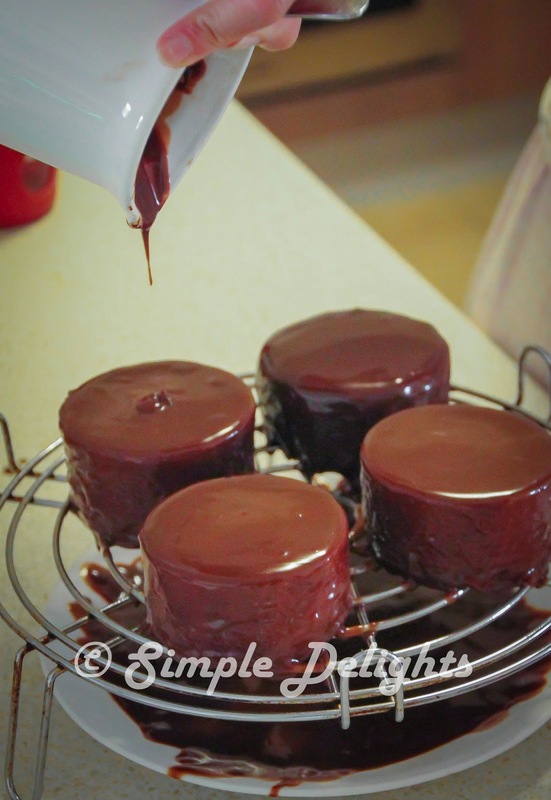 Unmold the cake and slowly pour the ganache over the cake. Decorate with fruit and chocolate slice before serving. It does take time to prepare this cake,it is not difficult just need patience. Time for raspberry jelly to freeze, time for chocolate mousse to set, to freeze up. Result ? Is worth it !! 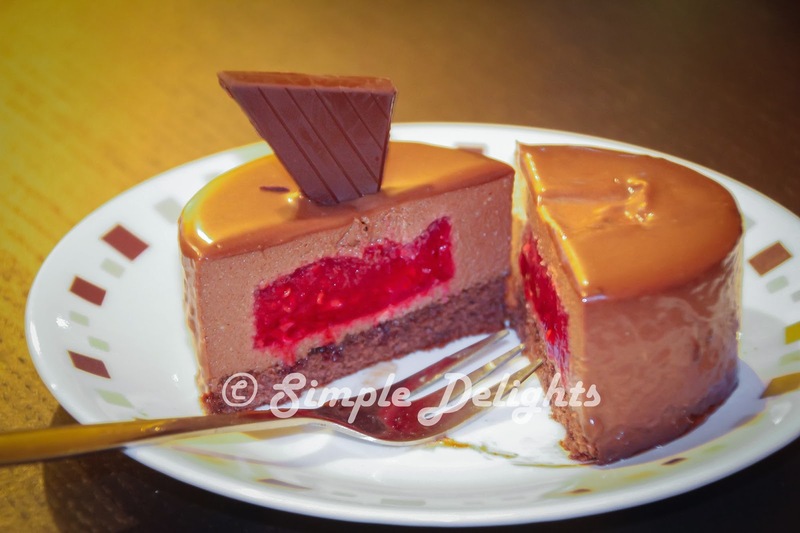 The mousse is smooth and the raspberry bring refresh to this cake and rhe chocolate coating is not too sweet. As a non chocolate fan , I do enjoy and love the taste of this cake. To improve, next time I would have to push the raspberry puree through a seive to remove the seed . I wanted to deco the cake with cherry but this does not bring out the color of the cake. At the end, mango still suit well. Give this a try and you might surprise yourself and your love one.